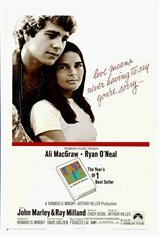 Wealthy Harvard University student Oliver Barrett IV (Ryan O'Neal) meets and falls in love with Radcliffe College student Jennifer Cavalleri (Ali MacGraw). They decide to marry, but because Jennifer is from a working class family, Oliver's father is opposed to the marriage and cuts ties with his son. Jenny gets a job as a teacher to pay Oliver's way through law school. When he graduates, he gets a job at a New York law firm. Still madly in love, they decide to have a child. After undergoing medical tests, Oliver is told that Jenny has cancer and doesn't have long to live.